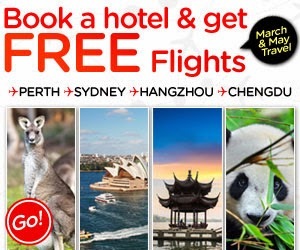 Browse » Home » Sydney » AirAsiaGO: Book a Hotel and get FREE flights to Perth, Sydney, Hangzhou and Chengdu! AirAsiaGO: Book a Hotel and get FREE flights to Perth, Sydney, Hangzhou and Chengdu! BIG Sale!! Hotels + FREE Seats! Book a Hotel and get FREE flights to Perth, Sydney, Hangzhou and Chengdu!